Nowadays, we all know that an active, busy and running lifestyle has consequences on our digestive system. Most people seek regular bowel movements, yet from time to time they start to experience days when they feel a lack of energy and their body feels heavy and lethargic. 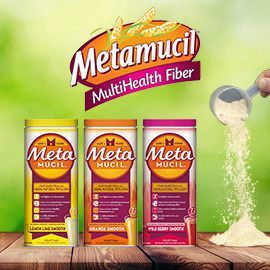 Metamucil is a supplement that contains natural Psyllium fiber, a natural plant fiber with multiple health benefits. Psyllium husk gels inside your intestines to absorb and remove accumulated wastes, like fats and oils. This helps your body’s natural toxin removal process by absorbing them in the digestive system and facilitating their excretion with more regular and natural bowel movements. Fiber is also a good way to prevent sluggishness and control blood sugar and cholesterol. As a result of taking Metamucil, you feel lighter and more active! Metamucil wants your help to make dosing and dispensing their product more convenient and effective, so people can include Metamucil into their daily routine. By making the product easier to dose and dispense, Metamucil wants to create a more delightful user experience for consumers. And this is where you step in! Design a delightfully convenient dosing mechanism for the Metamucil cannisters! Participate before November, 18th 23:59 UTC.